Earlier this week SRtRC reported on a story carried in the Daily Mail about a Lithuanian fan seemingly directing a Nazi salute to stewards at an Olympic Basketball game involving Lithuania and Argentina. Unbelievably, the same person was arrested at the Lithuania v Nigeria basketball match amongst a group of supporters making ‘monkey chants’ at Nigeria players on Tuesday, reports the Guardian today. A Lithuanian man who gave a Nazi salute during an Olympic basketball match has become the first person to be convicted of a racially aggravated offence at the Games and fined £2,500. 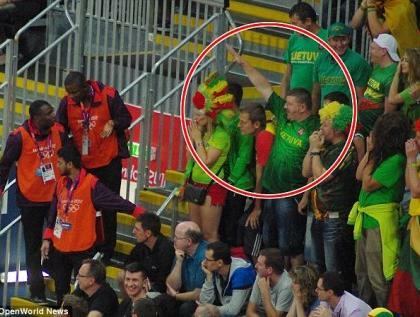 He was told that his behaviour and that of other Lithuanian fans was "despicable". Petras Lescinskas, 36, an accountant from Lithuania, was arrested on Tuesday at the Olympic basketball arena during the Lithuania-Nigeria match. Stratford magistrates court was told that he and other Lithuanian supporters had been behaving in such a loud and aggressive manner that other spectators moved away from them. There were "monkey-style noises when Nigerian players had the ball", the court heard. Becky Owen, prosecuting, told the court. "He was seen to make a Nazi salute," while placing his fingers across his lips. Lescinskas, a married man who had come to London for the Games, told police after his arrest that it was common practice in his country to celebrate in that way and it was something he has been doing for some time the court was told. He pleaded guilty to a racially aggravated offence under the Public Order Act. He said, through his lawyer, that he was "deeply embarrassed" and "deeply remorseful" about what he had done. Fining him £2,500 plus £85 costs, district judge Sonia Sims told him: "This type of conduct tarnishes the whole ethos of the Games." She said that his Nazi salute had been an insult to all those who had lost their lives in the Holocaust and his behaviour was "despicable." She said she did not accept that what he had done was acceptable in Lithuania. He was told that he would serve 28 days in prison if he failed to pay the fine. Undercover police were at the basketball arena after complaints about the behaviour of Lithuanian fans in their previous match against Argentina on Sunday.